I am in the spring painting mood right now and I have flowers on the brain so I will be painting a lot flowers for the next few weeks. If you want to see something special just ask and I will paint away. This the third virtual painting I have done. The virtual Paintout uses google street views as a resource for traveling the world to find interesting locations and subjects to paint. I did this painting on Saturday morning at small rural church. The bright red door struck me. I think I will work on another painting of the these doors there is just something about them that I find very charming. About This Painting:My tulips are up with buds on them soon to bloom. Graduation time is here. I am celebrating with yummy cupcakes. I am having a party today for everyone who has a spring birthday. Enjoy your birthday cupcake. Blow out the candle and make a wish.Happy Birthday to all of you! About This Painting:You know spring is here when the tulips bloom.May 2-9 will begin the annualhf Tulip Festival in Holland Michigan, this is a must see if you are in the area. There is a big eagal that comes from the park down the bay and soars over my studio, then in a flash he dives for a fish. I should say she dives for a fish because I have her nest and the fish bones far below on the ground picked shinny clean by the babies. Little hummingbirds can fly backwards. Their long thin bills let them drink nectar from flowers. Flowers are one of the subject I like to paint. Poppies are the ones that I have the most fun with making the stems twist and turn in the painting. A fun little You Tube on muffins http://www.youtube.com/watch?v=1tcR19y7GPM I like the paper clip muffin. Many people think spring begins when they see the first Robin, but for me it is when I sight the bright yellow line up of Peeps. Peeps now come in many colors but as a traditionalist I still favor the yellow ones. Peeps Easter Candy have been around for awhile, about 1940 the first peep was born. The orginal peeps had little marshmallow wings but they have lost the little bitty wings along the way as they changed colors. This line up of sugar and cornsurp mark the beginning of spring. 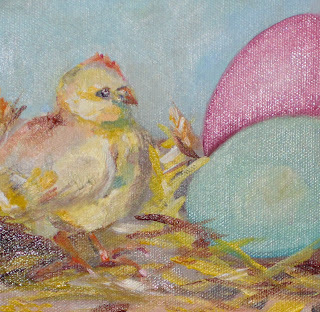 The nice thing about Easter as a holiday is that I get to do fun little paintings of chicks , colored eggs,Easter candy, and flowers. I had promised someone that I would paint another chicken Picture and now with Easter almost here it is time for chicks and bunnies. I have a pregnant squarel who visit my studio daily begging for some cat food. It is the time for babies and she is so hungry she gobles up the dry cat food. This is a study for a larger painting I am thinking of doing. Sea shell, the ocean,some boats in the bay , does it get any better? Have a wondeful day.